Young people who went through pre-school education are much more likely to do well in international Pisa tests when they are teenagers, says the OECD. But the international think tank says to maximise the benefits of early years education, there need to be places for the poorest families. 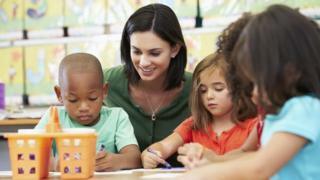 The OECD says the UK has low levels of hours in pre-school education. There are plans in England to double the amount of free childcare to 30 hours, but only for working families. The OECD study says there are significant economic and personal benefits from investing in early years education - and it supports the move in England to extend access to pre-school places. At present, the 15 hours of free childcare is among the lowest levels of provision of any OECD country, but it will rise to 30 hours in the autumn, for families with a working parent. Andreas Schleicher, the OECD's education director, says that he understands the argument for focusing pre-school places on working families - so that parents can afford to go out to work. But he says that such an approach can reduce the educational benefits of early years support, which is greatest for those from the most disadvantaged families. The OECD study shows that by international standards the UK has high proportions of children in workless families, particularly in lone-parent families. These may miss out if access to early years places is focused on working families. Mr Schleicher highlighted the importance of pre-school education in giving children a strong start. This extended beyond learning, with the study highlighting links between access to early years education and reduced levels of obesity. But the report warned that spending on this sector could be patchy and that staff could be less well-paid than in the school system. Pre-school staff in the UK have seen their pay fall in real terms since 2010, says the OECD survey. Looking for good quality pre-school places could also be much more difficult for parents, compared with the amount of information available about schools. Mr Schleicher said the variety of early years places could be "very fragmented and hard to navigate". Neil Leitch, chief executive of the Pre-school Learning Alliance, said: "We have long argued that, given current limited resources, the government should focus its spending on where it is needed most. "As such, we remain at a loss as to why there has been no attempt to rethink the current eligibility criteria for the 30-hour offer." A Department for Education spokeswoman said: "We are investing more than ever before into childcare - £6bn per year by 2020 - and doubling our existing offer of free childcare for all three and four year olds to 30 hours for working parents. "We are also supporting the most disadvantaged families with 15 free hours per week for two year olds, our pupil premium which is worth over £300 a year per child and our new Disability Access Fund, providing £615 per eligible child."